Algarve Region Of Portugal – A good holiday has to have many elements (sunshine and good company are usually fairly crucial) however, one ingredient remains undisputed: good food. Sampling a county’s culinary delights is a major part of any getaway – whether you’re just heading across the border or flying 12 hours to be immersed in a completely new culture. As a continent, Europe is extremely varied in its approach to lining ones stomach – and Portugal’s southern-most region, the Algarve, is no stranger to mouth-watering local delicacies. Boasting an impressive coastline running right along the south and west of the region, The Algrave is surprisingly well known for its seafood. There is always a large array of fresh fish dishes on restaurant menus and seafood options are lovingly produced with the local catch of the day. 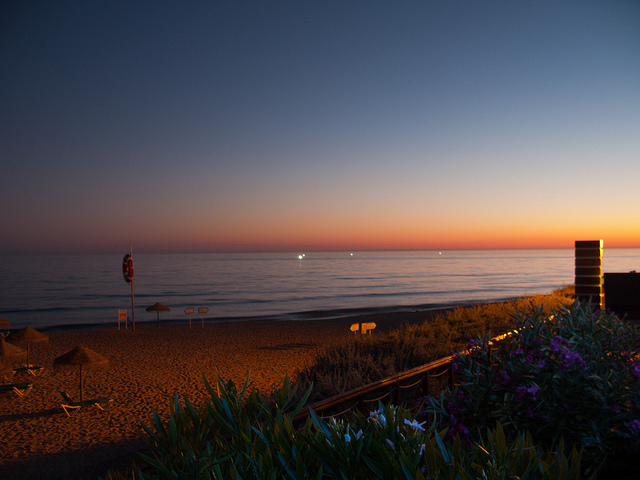 Restaurants are easy to come by and many offer views of the pretty Algarve beaches ready for you to soak up while you eat. Prawns served with garlic and piri-piri and washed down with chilled vinho verde. he rice and fresh fish is cooked with tomatoes and peppers and garnished with fresh coriander or mint – a real Algarvian classic. Replace rice with pasta and you have a delicious dish guaranteed to satisfy a rumbling tum. Bean stews are a popular Algarvian dish and come with a variety of different seafood’s (or meats) added to the mix. This dish is served in copper dishes and includes either pork, clams, fish, chicken or rabbit. Of course not every restaurant focuses on Portuguese food with many first-rate international restaurants popping up throughout the region. 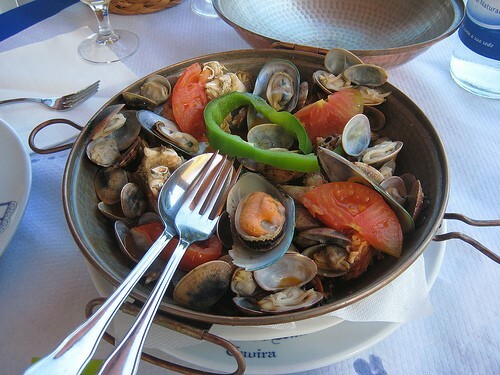 As well as local restaurants, you can also eat in the many first-rate Algarve hotels. Quinta Bonita Luxury Boutique Hotel in Lagos is a fine example with the chef sourcing local, organic produce and wine coming from local Portuguese boutique wineries. Pequeño Mundo is definitely worth investigating as not only will your taste buds be teased by the delicious French cuisine (the Crepe Suzette is to die for) the setting – an old Portuguese villa – is pretty special too. It makes a really romantic setting if you are looking to impress and the service is second to none. Nevertheless, whichever Algarve accommodation option you go for, one Portuguese delight you should definitely add to your ‘to-taste’ list is sardine – just maybe lay off the room service. 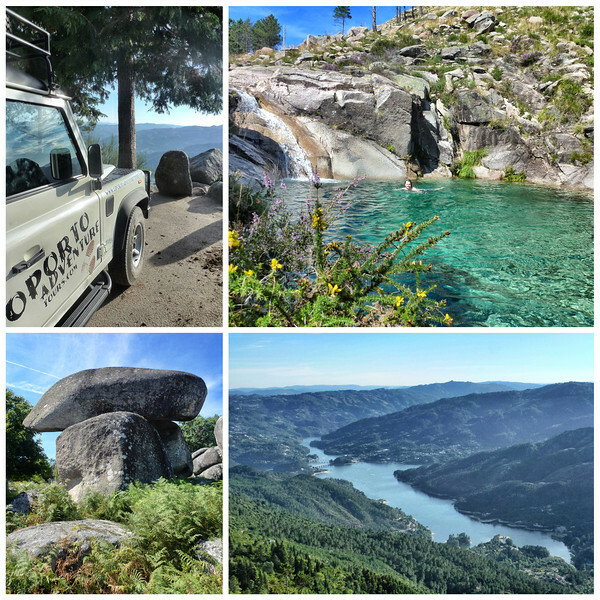 We were so excited when we found out about Oporto Adventure Tours, a new company which offers tours from Porto and Braga to Peneda Geres, the incredible national park. The company has made one of the best parts of Portugal accessible for tourists to visit in just a day – making it a must-do for anyone visiting Porto. Together with Carla, our guide, and 3 Portuguese couples, we jumped in the Jeep and started our adventure along the narrow winding roads to the park. After driving further and deeper into the park, and stopping by to swim in a crystal clear lagoon, we arrived in a small rural village. The tiny village has only 100 residents, and being so far from civilization they don’t use money – instead, they trade services with each other. The car stopped by a horse stable, where a little boy greeted us with a big smile – we were all supposed to jump on a horse and ride through the village. My legs were shaking already before I climbed on the horse, and for some stupid reason I chose the biggest one because I made up in my head that it was older and wiser. This turned out to be completely wrong, since me and my horse didn’t get along at all..! As soon as we set off, my horse went straight for the bushes on the road side and branches above his head – all he wanted to do was eat, eat and eat, and he was getting increasingly frustrated by my nervous commands. It didn’t matter what I did, because my horse had a will of his own; he stopped to drink when he wanted and ate when he wanted, and while Nathan was enjoying the incredible views and atmosphere, all I could focus on was my horse. While I was blaming everything on the horse, I knew that it was probably just me again. I guess I should have learned my lesson from last time in New Zealand when a horse kicked me so hard I flew several meters in the air – at least this time I didn’t fall off, so maybe I’m getting better? The Portuguese couples we traveled with had been to the park many times before, but the reason they went with Carla on the tour was because they wanted to explore parts of the park that they didn’t know about. Carla took us to places that are not only unknown to foreigners, but to many of the locals. After an exhausting walk through some of the park’s most rugged areas, soaked in sweat, we finally arrived at one of the most beautiful lagoons I have ever seen. The water was turquoise and absolutely crystal clear, surrounded by smooth cliffs and a pouring waterfall in the corner. Although we had already taken a swim in another lagoon (that one with green clear water) we were so warm and sweaty we couldn’t wait to jump in. 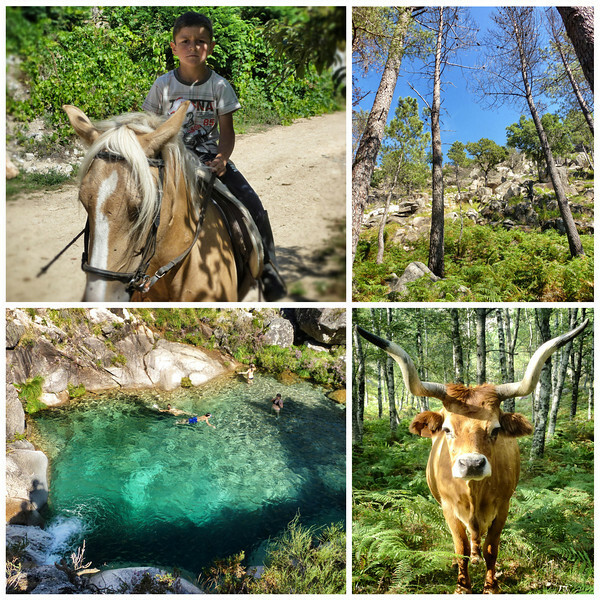 The nature in Peneda Geres is incredibly varied, from lush forests, cascades and massive waterfalls, to rugged rocky hills. There is a lot of wildlife in the park, from wolves to wild horses and the Cachena Cattle, which are typical for the area, and which were everywhere on the road side as we drove back home. Carla had really given us a unique experience and showed us places we would never have been able to find on our own, and we would definitely recommend that you check out their tours when you visit Porto. We had actually planned from the beginning to make Porto our final destination while visiting Portugal. After walking around for a few hours, I really wished we had more time there. There was something raw about this place that I wanted to find out more about. There was a roughness to the town, and a charisma of the people that I didn’t want to leave so quickly. After a stressful and rushed visit to Paris, we really needed a few days rest – so we decided to spend extra day in Lisbon – DOING NOTHING! We both really loved our stay in Lisbon, and can’t wait get get back to the explore more of Portugal. We’ve just jumped on the Tram 28 in Lisbon, and the cool thing about this tram is it’s not actually a tourist tram. It’s a local tram, so anyone can get on here, and it’s used to get around the city. 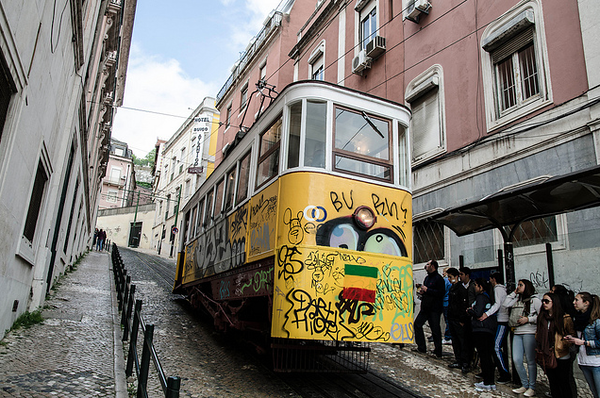 It’s become an icon for tourists in Lisbon to come her and jump on, because the tram goes all around the old parts of town. It’s a great way of seeing Lisbon, so you can get an overview of the whole city. It’s a really old tram as well. We’ve just jumped off the Tram 28, we’ve gone the whole way through Lisbon city. At one point, we thought we were completely lost, but we actually got off where we wanted to get off. So we’ve seen the Old Town. Now we’re going to go taste a local Portuguese—Pastel de nata. It’s like a local Portuguese style of custard tart. So we’re tasting the pastel de nata, a custard tart, traditional Portuguese recipe. You can tell that they’re filled with custard. The cinnamon on top is really nice too. Yeah, putting that cinnamon on top, perfect combination huh? It only cost about 90 cents. It’s getting really warm now. Portugal this time of the day, it’s too hot to walk around. It’s too hot to do anything really. So we’re going to grab some lunch and go over to the hostel and rest. And then this evening, we’re going to go and watch the sunset. There are seven hills in Lisbon that have great vantage points over the city so you can watch the sunset. We’re going to do that this evening. Then we’re going to go down to the Old Quarters and try some port wine and listen to some fado music. Wait until it cools down a bit. We came here to watch the sunset by St. George’s Castle. Turns out that you have to pay for it, and the whole area is fenced off. So we tried to find a free view, and here it is. It is fenced off, but I think it is absolutely beautiful anyway, and it was totally worth the walk up here, walking through the little neighborhoods, and the narrow streets, and seeing the little cafés around here, and the people hanging out by the doors or in the windows, talking to the neighbors. It was really cool to see. Ok, we found the same view five meters down without a fence. So we’ve got an incredible view right now. There’s a church over there that is absolutely beautiful. It’s amazing what you can find when you just walk down three meters down the street. That’s the thing, if you get a bit of interest, go around the corner where no one else is going, you get an incredible view of Lisbon. It’s absolutely—to be honest, it’s one of the most incredible views I’ve ever seen in my life. The sun’s about to set right there. That’s a great way to finish the day. It’s been a busy day, we’ve gone around the whole of Lisbon. Honestly, it’s one of the best wines I’ve ever had. I haven’t even tried port wine before. It’s very sweet, it’s very fruity. It’s been a great day though. I love Portugal, I love Lisbon. Yeah, I’ve had a really good—That sunset blew me away. Spend 3 Days – Gain 3 Pounds. In some streets it’s actually difficult finding a restaurant among the dozens of bakeries selling amazing cakes and pastries. It’s hard to choose among all the goodies here, but the famous Pasteis De Nata were definitely in the top 3! At any time of the day there are locals in the cafes having pastry for breakfast, snack or after dinner dessert. But pastries in all their sugar and glamor does not even compare to the crazy local favorite meal in Porto: the Francesinha. This is – believe it or not – a sandwich. The Views In Both Porto & Lisbon Are Incredible. In Lisbon, you can spend a lot of time visiting the many different ”miradouros” – viewpoints, which are spread out over the seven different hills surrounding the city. In Porto, the homeless guys have the best view: Living in the abandoned and totally rundown houses overlooking the river. The plants had taken control of the houses and completely buried some underneath its green bed, which to be honest – was part of the beauty. The location was priceless, yet nobody lived there – or so we thought – until a homeless person jumped up from the wall parting the buildings and us, greeted us politely, and walked away. The Buildings Are Built With Bathroom-Style Tiles On The Outside. Shiny bathroom tiles and what looked like porcelain makes up the outside decoration on many of the buildings and churches around town. This is a very traditional kind of decoration on houses there, which we saw a lot of it in both Porto and Lisbon, especially in the old areas. This really adds color to the buildings, and makes each one very unique. I can’t help but to think of the tiles you have decorating your kitchen and bathrooms with, but it’s pretty cool to see people using it in a completely different way. They Stand Up While Eating. I couldn’t make any sense of this. In all cafes, people would ignore the many free seats and tables, preferring to stand up to eat their soup on standing at the counter. Were they really that stressed? Were they trying to avoid wrinkles on their suits? Were they taking an opportunity to stand up a little before going back to work in an office? Romantic Portugal so far has been my personal favorite country on this trip, I loved the vibe, the cities and the people. 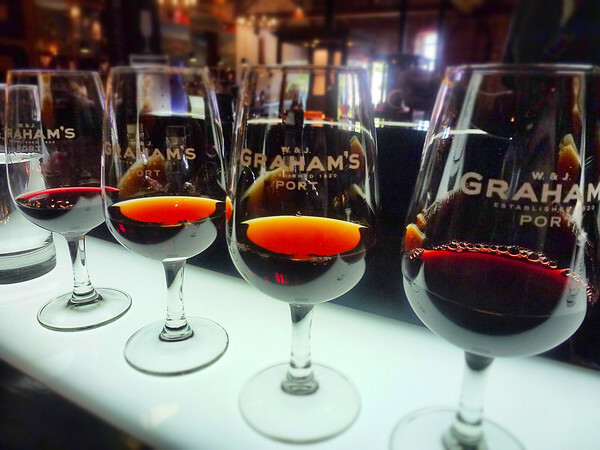 Port Wine Tasting In Porto is perhaps most famous for its delicious Port wine, which can only be made and produced in Porto – last year while visiting Lisbon, and The Algrave, we tried the famous port for the first time, and absolutely loved it. Although we’re not heavy drinkers at all, we could tell that the Port wine tasted different from any other wine. 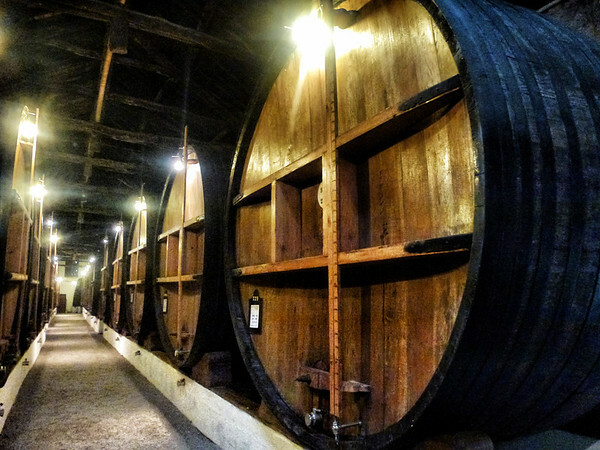 So when visiting Porto, we went to three of the best and oldest wineries to understand more about this sweet wine, and of course to taste some wine on a romantic trip to Portugal. 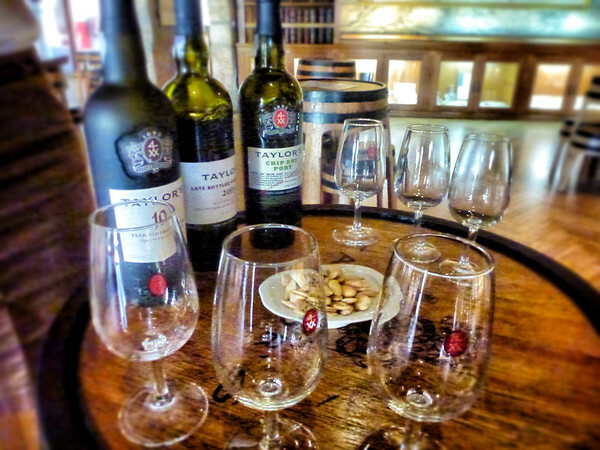 Taylor’s is a family run business, and it’s one of the oldest wine companies in Porto – founded in 1692, the company has a fascinating history, and Ana-Sofia passionately told us about all the important people and moments that has made Taylor’s what it is today. For Taylor’s, the three most important keywords are tradition, quality and innovation. Tradition because they are a family business, not just the high up people, but a lot of their staff works there for their entire lives and their sons and daughters too. Quality because they are very picky and careful with the wine they produce, and still choose to make wine the traditional way with men and women treading the grapes. The traditional treading is a crazy and difficult part of Port wine making (they stamp the grapes for two hours in a quiet, steady rhythm, and then spend two hours dancing around and singing to traditional music – all of this after 8 hours work in the field!). Finally, innovation because they’ve been the creators of many of the latest port wines, such as the Chip Dry and LBV, which has gone from being a total “disgrace” to the most popular wines of all. The views over Porto and Gaia from Taylor’s terrace are simply amazing, and is worth a visit alone. “We might not be as fancy as other places, but we want to show our visitors the real thing – this is not a museum, it’s where we work”. When asking the staff at Graham’s how they would describe their company in a sentence, Tomas, our guide, said “Looking to the future and improving techniques while still maintaining the tradition”. The tour was very well laid out for visitors, with an introduction video, a walk through the storage cellars where they store the wine and let it age, and finally the tasting at the end. We loved the bar’s light which made it easy to see the difference in color between the wines – this place had really taken attention to details. They’re currently in the middle of a huge renovation, where they will add a couple of things to give visitors an even better experience. In the beginning of next year, there will be a museum, and a restaurant where you can sample some food together with the recommended port wines. We had a great time with Tomas, who had an answer to every one of our questions, and while tasting the different wines we realized just how different they all are. Croft, which is owned by the same company as Taylor’s, has a more fun atmosphere and style to it rather than traditional – we went there for the sole purpose of trying some of the newer styles of wine, like the Pink port wine, which is perfect for refreshing cocktails and mixes. We had no idea just how many types of Port wines there were. We started the day thinking that there was only one Port wine and it was a red one, to having tasted 10 different types of Port, that were all unique from each other. We didn’t realize just how many glasses we would be tasting, and after going to all three of them in the same day – we were pretty tipsy when we finally checked into our hotel. Another thing we didn’t know was that Port wine is much stronger than other wines, with at least 20% alcohol – so if you’ve planned to take a wine tasting tour, sip your wine slowly..! If you’re not much of a wine drinker, there are lots of cocktails that can be made with Port wine, try Port Tonic for example. 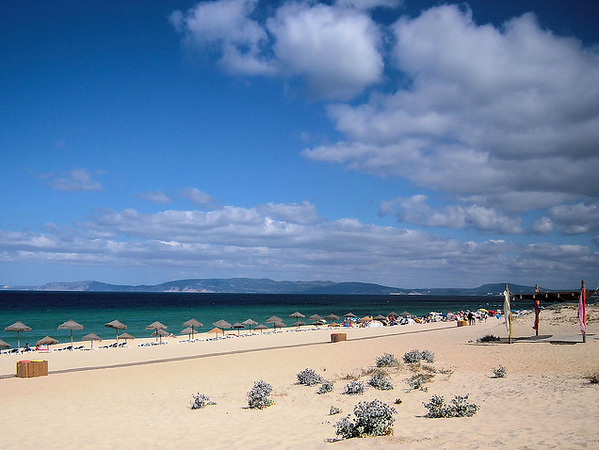 Portugal’s famed Golden Triangle is a great way to relax and indulge in all that the area has to offer. With a sunny climate, luxury villas and a beautiful natural setting, the hardest decision visitors will have to make is whether to unwind at the beach or by the pool. Almancil makes up one corner of the Golden Triangle, and is a useful stop for shopping for essentials on the way out to your final destination. It’s also home to the São Lourenço church, which is a stunning example of classic Portuguese architecture and decor, as well as the Estádio Algarve, where it’s possible to watch both local and charity football matches – more notably, it was the site of Euro 2004! For those looking for a golfing experience with their sweetheart, the Golden Triangle is golfer’s heaven as it has 12 world-class golf courses and features several tournaments throughout the year. Many of these courses are located nearby the Quinta do Lago complex, including the Pinheiros Altos, San Lorenzo, and Quinta do Lago North and South courses. 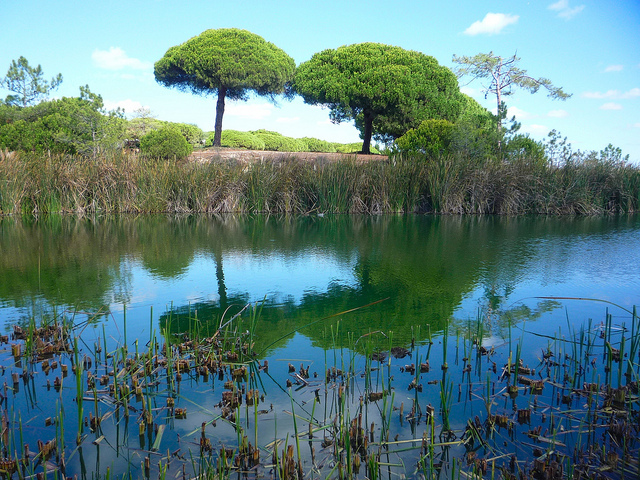 Quinta do Lago is also on the border of the Ria Formosa Nature Reserve, and hiking trails lead into a serene countryside with pine trees and lakes. In town, visitors can buy local crafts such as pottery and ceramics and can feast upon local seafood. The nightlife is a draw here, with several highly-rated restaurants, bars, and clubs… making it a perfect setting for a romantic weekend. 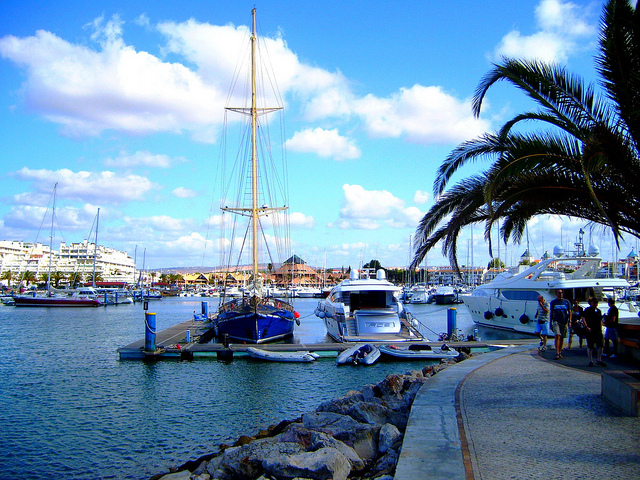 Quarteria, with its Vilamoura complex, makes up the third point of Portugal’s Golden Triangle. 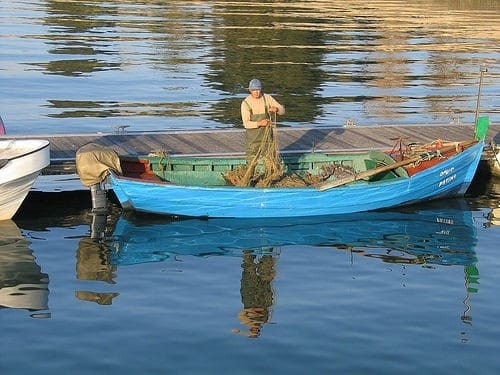 A fishing port, it is famous for its lovely beaches and boardwalk, and it offers a marine life show that is extremely popular with vacationing families. This would be the perfect setting for a romantic walk on the beach or to catch the sunset with your special someone. For those a little out of town can pick up supplies here, as well as souvenir handicrafts. A trip out to the Roman ruins of Cerro da Vila is also a popular day trip. The resort towns and luxury villas of the Golden Triangle are known for their luxury and also for their safety. You can opt for a private rental which is a guaranteed, hassle-free experience and will give you that private romantic setting you’re looking for. From water sports to fine dining, nightlife to the solitude of the Great Outdoors, Portugal’s Golden Triangle is a top destination for a truly relaxing holiday. Landing in Faro, one of the closest European cities to the equator, it’s so warm that you can see the heat sizzling from the surface of the runway. In a nutshell, Portugal is a country-sized oasis that shares its tourism popularity, beautiful landscape and Latino atmosphere with neighbouring Spain. Still, it has a passionate identity of its own and only those with a heart for adventure can truly experience it all. The best way to get around Portugal is by car – there are trains and buses, but they are pretty unreliable (strikes) and take a long time. Book a rental car with air conditioning and you’re free to follow this guide to exploring Portugal in the most awesome way possible – cruising along its western coast. 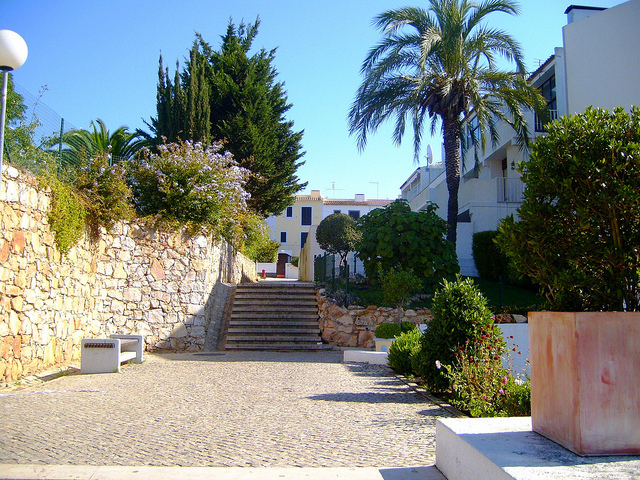 You’re starting in Faro because you’re about to embark on a round trip, one which can be done within just two days, so this city will be your second-home for the remainder of your holiday and its location on the southernmost tip of Portugal’s mainland means it’s almost tropical – the perfect base for a driving holiday. Plus, you can get a quality deal from Holiday Autos on car hire at Faro Airport – 20% off for certain cars booked before October 31st – so, with a car fully equipped with air-con and enough cup holders to carry multiple thirst-quenching cans of lemonade, you’re set for the open road north. First, you need to stop off at Café Alianca, just 10 minutes from the airport – over 100 years old, this place is something special and if the architecture of the Jose Pedro da Silva building isn’t enough to convince you, the feeling of the fresh coffee washing down a traditional Spanish pastry will. Take the A22 westbound, away from the main highway and onto the open coastal road travelling north (N120). 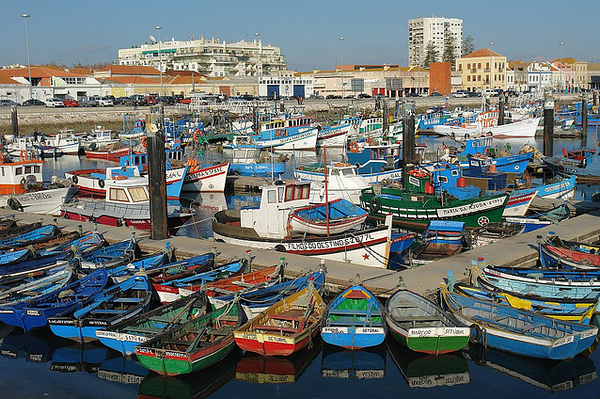 This route is the best as you don’t lose any time and you can spend more time in the Old Town of Sines – the midway point between Faro and Lisbon. The roads in Sines are lined with palm trees and the battlements of the town castle, looking out into the Atlantic, provide the perfect setting for an early photo in your adventure album. Now, you can link up to the A2 highway from here quite easily but it’s all about the shoreline drive, so stick to the N261 and head towards Cambado. The sheer size of the sun as it sets into the Atlantic on your left is worth the detour alone – this is why you picked up a car rental in Portugal. Quick tip: Make sure you take a right onto the N253 not the N253-1, when you have the choice. Basically, follow the signs for Motinha, then ignore Motinha altogether and follow the N253 through to the A2 … it’s not as complicated as it sounds and even if you do get lost, all those villages along the Estuario do Sado river are beautiful in their own right. Once you’re on the A2 (there’s an electronic toll by the way – if you don’t have the change, you can take a ticket and pay the euros at the post office when you get to Lisbon), it’s time to focus on the road… or take some more scenic diversions as you pass through Setubal – a city famed for its beaches and wine (best to stay off the latter when behind the wheel). Entering the city via the Ponte Salazar suspension bridge, over the Tagus River, really lets you know you’ve arrived in the capital – all the raw Portuguese culture is behind you and in Lisbon, you’ll be welcomed with an array of travellers from all over the world, along with some passionate Lisbon too of course. You can head into the touristy centre of town but the hostel-surfers in Europe will all agree that a bar like Pavilhão Chinês is what the real Lisbon is all about. Sit down in this quirky venue, decorated by what looks like a hoard of stolen merchandise from the capital’s Ancient Art Museum, and tuck in to the tapas here – the ridiculously well-dressed bar staff are particularly proud of their dishes and you can fill your belly in Portugal. Stock up on some Lisbion photo moments in a whistle-stop tour around the city (make sure you visit Jeronimo’s Monastery) and head back to sunny Faro the next day. Take it slow and enjoy everything this traveller’s hub has to offer, both in the city and out on the suburbs (Sintra Cascais National Park is another Portuguese paradise only really reachable by car, on the outskirts of Lisbon). Keep heading northbound along the coast to Porto, the second-largest city in the country and one of the best holiday locations in Europe. Whatever you choose, you’re memory-making holiday in Portugal will only get better as it goes on – take advantage of the many places for wine tasting in Portugal – then you’re free to travel the entire country – the best bit has to be returning to Faro and knowing exactly where to pick up the best coffee, this time it will be you swapping the travel stories and travel tips with fresh road-trippers. 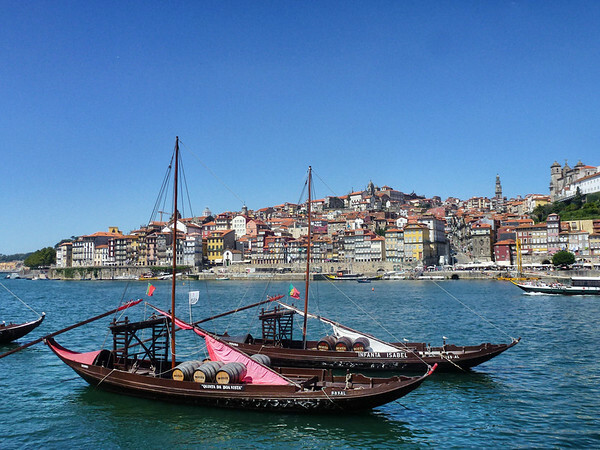 When arriving in Porto, we took the bus over to Foz, a beautiful residential area of the city, and checked into 4Rooms, a Bed & Breakfast hotel which has gained quite a lot of attention during recent years. 4Rooms is located on a small, narrow, cobble stoned street in the old Foz, which locals like to describe as the real Porto. “Nobody lives in the center of Porto, instead, people live in Foz, and staying in this area will give you a very different experience compared to the center”, says our host Katrina. 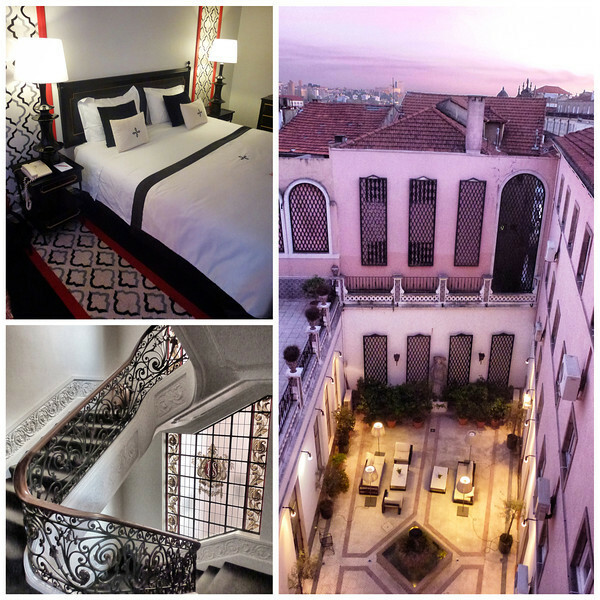 And that, is exactly what 4Rooms is all about: experiencing Porto from a different angle. 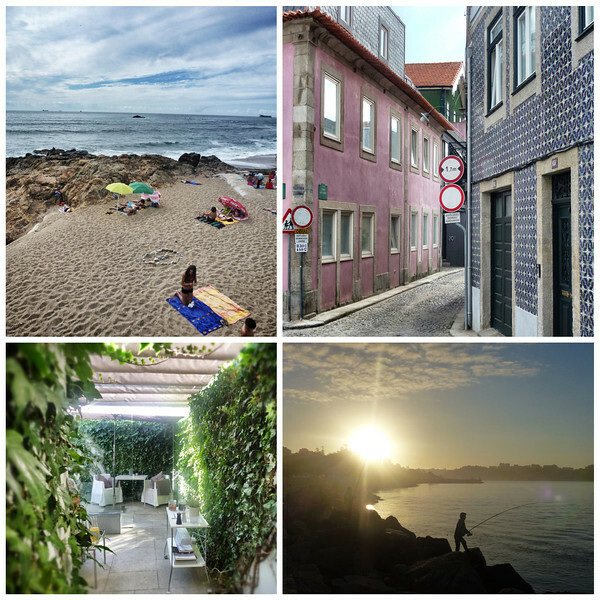 The B&B is surrounded by colorful mural buildings, small corner shops and cafes, and is just a 5-minute walk from the beach – the B&B is a very stylish little gem, designed by Eduardo Souto de Moura, a famous Portuguese architect who won the Pritzker Prize in 2011. Since the place only has 4 rooms you get a very personal service from the attentive staff who truly give you the service of a 5 star B&B, with free snacks and drinks that were re-filled several times a day, iMac, iPhone docking station, small kitchenette, jacuzzi and obviously amazing interior design all over. Our favorite was the window in the roof above our heads, which we kept open during the night so we could gaze at the stars. Katrina would help you with all the advice you needed, with places to eat and things to do in the area, and they could even organize personal tours and take you around Porto and its beautiful surroundings. 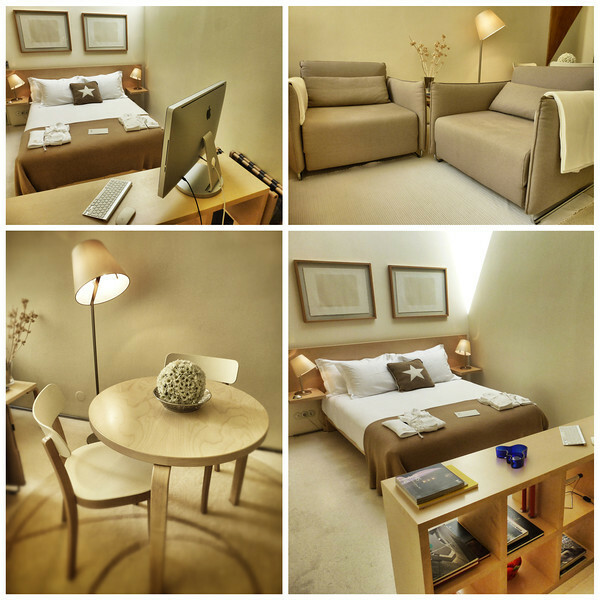 If you’re looking for a unique B&B with friendly service – 4Rooms is the place to go when visiting Porto! After a long day of Port wine tasting, we finally checked into Hotel Infante Sagres, which couldn’t have given us a better ending to our day. We didn’t have to worry about the usual map confusion and spending half an hour looking for the hotel, because it was just there, right in the middle of the center in the best location of Porto city – perfect. When checking in at the reception, we were offered a glass of Port, which was very fancy, but by then we had probably had over 10 glasses of Port that day already. 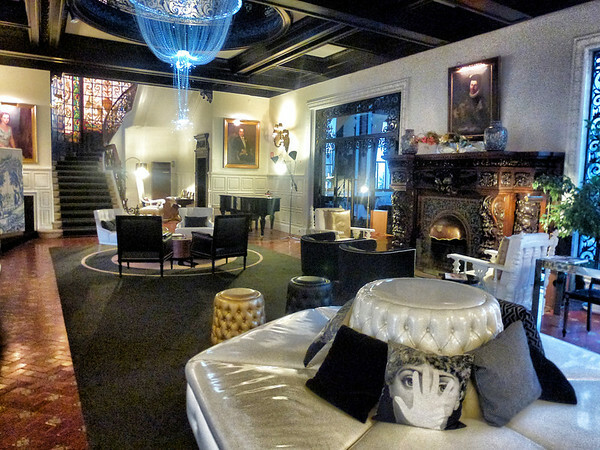 The luxury boutique hotel looked amazing inside, with high ceilings, crystal chandeliers, fire places and hang out lounges, and even a couch in the elevator. With a museum, two terraces, a spa, a bar and beautiful restaurant which made you feel like a royalty when having your breakfast in the morning – you can easily understand why it’s part of the “Small Luxury Hotels of the World” collection. The hotel is a very elegant and traditional 5-star hotel, and we really appreciated the small details like the magazines and chocolates that were handed out every afternoon, and being surrounded by some great cafes, bars and restaurants – we never had to walk very far. If you feel like splurging out on your trip to Porto, this is definitely the place to do it, and you can’t get a more central location than this! 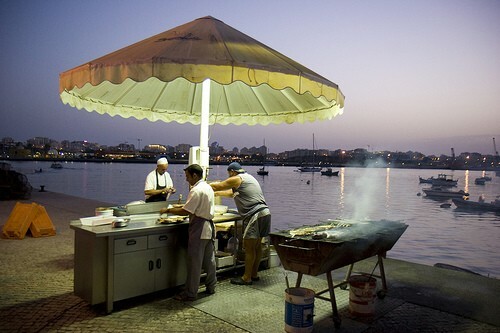 oh Portugal sounds like a wonderful place to indulge in fresh fish! wow, so many interesting dishes to try when I am there later this year. Yum! I wish we’d tried some of this while we were in Lagos, but we were on such a tight budget and most of the cheap eats around there (or maybe we weren’t looking hard enough) weren’t traditional Portuguese cuisine! Next time! yum! 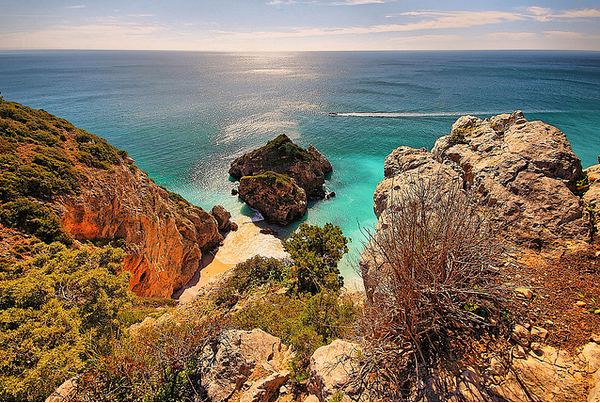 i would love to travel to portugal, thinking about adding it to my list of places to visit this summer while in Europe. yup – they sure do sound interesting eh! hope you get a chance to test them all out! The first time I tried Camarao was one of the most unforgettable dinners I had. Since then it has become one of my favorites. I have a Portuguese friend that would often invite us for dinner and I always look forward to what exciting dish would she prepare. oh that is wonderful – getting a Portuguese friend sounds like a great idea 😉 hehe. I order tea in a cafe.There’s some confusion over the order, so I explain it meticulously (probably creating some tension)They laugh to break tensionI get annoyed and fell like they’re mocking meI become visibly aloof/annoyed, they laugh more.They all look at me as I’m sitting down and laugh together. Really getting to me by now…They say goodbye as I walk out, in my stewing annoyance I ignore them. They laugh more at that. It’s this vicious cycle of misinterpretation… How do you handle it? I cant bring myself to laugh when something isnt funny, and yet just being “moody” provokes more of it, whereas at home people would get the message and turn on the professionalism. It just really gets to me! Ultimately its being too sensitive, I know that – but how do you people who can “go with the flow” handle it though? Love to know! Dealing with miscommunications daily can be a real annoyance, but in many countries you travel to it comes as part of the package. It is important to know why they’re laughing. In Thailand, people laugh when they are nervous and smile when they’ve done something wrong. It is not meant as a condescending gesture toward you (although I can understand why you would take it that way), but a way of dealing with their own embarrassment. When they’re confronted of doing something wrong, when they don’t understand, or when someone gets upset with them, they have “lost face”, and the smiling and laughing is a way of trying to come with terms with it. The angrier you get, the less it will help. The best way of dealing with this is to try and be patient, smile a lot, be as friendly as you can be, but still try to make everything as clear as possible. One way of avoiding these misunderstandings is to go to more high-end places where waiters and staff speak better English, and can understand you better as well as having been lectured in customer service.